My preceding discussion about the pitfalls of "natural stepping"1 has prompted me to address the issue of why so many karate schools put great emphasis on stepping in basic stances. Certainly, historical factors play a role: just before and after World War II, karate was popularized in Japan as a kind of exercise for school children. 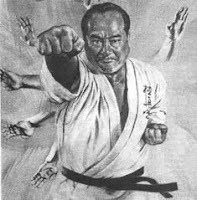 Karate masters like Gichin Funakoshi (who was a school teacher and who is credited as being one of the first to introduce karate to mainland Japan) are said to have quite deliberately tailored their classes to mass teaching, emphasizing basic training in large groups, often at the expense of bunkai (applications) and more in-depth understanding. "Walking up and down the floor" - training that is still typical fare in many of the world's dojos. Given my previous reservations about "dead time" in natural stepping and the fact that this sort of training is inherently very basic, you might be forgiven for thinking that I do not put much stock in it. But the reverse is true. I spent my first 4 or so years of martial arts mostly training in this manner. My own early teaching was defined by it too. I credit such training with a lasting legacy of solid basics and contextually relevant kinaesthetic awareness - a strong foundation that has served me well through the years not only by providing me the necessary muscle memory, strength and endurance but, more importantly, ensuring my adaptability across a very wide variety of martial disciplines. Over the last 25 years as a teacher, I've occasionally tried to shortcut training methods and avoid basic "natural"1 stepping practice. 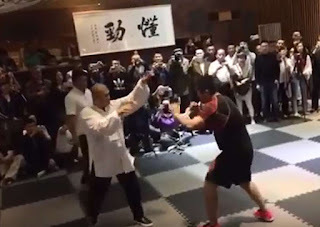 This is particularly since it has so little appeal to me at this point; the basic footwork I'm more inclined to work on is that from xingyi or bagua - not the oh-so-familiar basic (natural) karate stepping and punching/blocking etc. Xingyi footwork might seem easy - but, as I've often said before, it virtually requires you to "rewire your brain". This is the sort of stepping that interests me at my stage of learning. However attempts at "shortcuts" for my students have always led to the same result; slower progress and a weaker foundation. Inevitably I've found myself going back to the same fundamentals with them. Because, in the end, there simply is no short cut. You have to learn to walk before you can run. In this case you have to learn to "walk up and down the floor" before you can do more advanced traditional martial footwork. The concept of walking up and down the studio floor can seem quite daft to the pragmatic fighter. And, as I've often stated, if you want to learn to "fight" in a short space of time this isn't really an optimal pedagogy. But the traditional martial arts are not about short term gains; the goal is a deeper, lifelong journey - not an ability to "fight tomorrow". In order to absorb and master traditional martial arts skills, you need to have a solid, classical foundation - in much the same way as a classical pianist can't avoid learning to read music, play scales etc. Walking up and down the floor might not translate directly into short-term "fighting ability" but it does provide some of the necessary foundation for applying traditional civilian defence strategies. Without that foundation these strategies don't work (at least, they don't work optimally). It's all very well for me to say: "Walking up and down the floor is old hat - let's do something that is far more advanced," when I've had decades of wearing that "old hat". Whenever I have attempted to shortcut my students' development I've in effect short-changed them. Whatever skill I have now is not a function of what I am doing now; it is a function of all that went before. In much the same way, a beginner body-builder can't hope to adopt the training routine of a champion; his needs and the champion's needs are very different at that particular point in time. So what are the needs of a beginner that are addressed by basic stepping? 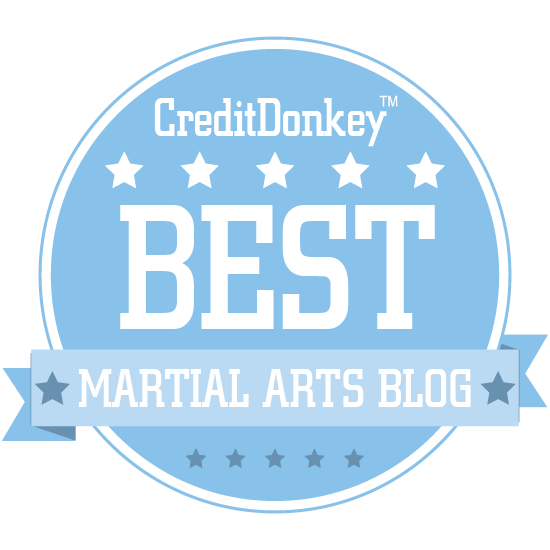 What exactly does the classical martial artist learn from "walking up and down the floor"? I have previously discussed (at some length) the role of traditional stances, so I don't propose to cover the same ground again. 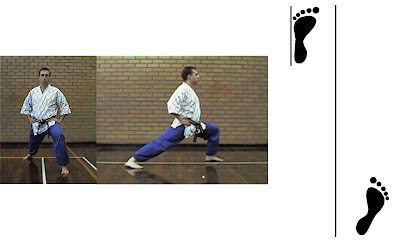 Instead I want to focus on why one should practise stepping - specifically natural1 stepping - in those stances. Given my recent remarks about its lack of application in fighting, what possible reasons can there be for including this in one's martial arts pedagogy? 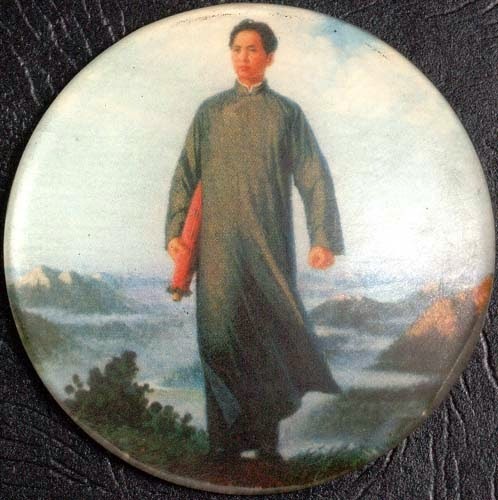 Put another way, traditional stances mark the points of relative stability in martial movement. Because stances are points of stability, this encourages many to view them statically; as "postures" that one should "hold". Nothing could be further from the truth. So, given that stances are not intended to be used statically, it makes sense to put them into a dynamic context. What better way to do this than by natural (ie. full) stepping? Yes, you might adopt lunges and other "shorter" stepping patterns; these are laudable training methods that I use frequently.3 But there is one benefit that natural stepping confers that is not present in these "abbreviated" stepping forms: natural stepping involves a bigger movement. Why is this important? First, the bigger the step, the greater the dynamic context. A greater dynamic context is always important in developing kinaesthetic awareness and timing. Second, using big (full) steps is akin to dropping lower into your stances; it adds load (ie. difficulty). If you can move quickly with a full step, any other form of stepping is going to be made easier. This is particularly because a full step contains the "dead time" to which I have previously referred. In other words, natural stepping is useful as a training aid precisely because you are forced to deal with (and minimize) "dead time". Last, what is true for basic blocks, punches etc. is also true for stances and stepping: A larger movement amplifies your errors, permitting analysis, correction and refinement. And, as I've frequently argued, a law of entropy always works against you adopting these bigger movements under pressure. Just as it is erroneous to say: "If I train in low stances, I'll go too low in a fight," there is really no danger of you "taking a full step" in a fight where a lunge would have been sufficient. So basically full natural steps provides a dynamic context that permits the inculcation of good form. But what is "good form" in stepping? The single biggest issue one encounters with footwork (or martial movement of any kind) is extraneous movement. For one thing it takes time - time you don't have. For another it telegraphs your intention. 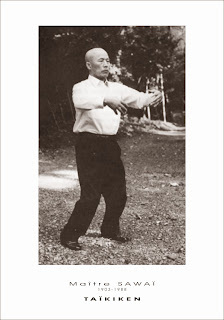 Full stepping in forward stance (zenkutsu dachi) is especially important in grooving efficient movement because it amplifies common extraneous movements and telegraphing. The most common of these is the "front foot out-turn". What is this? The forward stance has the front foot angled so that the outside edge points forwards. This is a stable position that protects the more sensitive inside edge of the knee. I think there it is no accident that the forward stance is found in all Asian fighting disciplines. Moreover, lunges in savate, Western fencing etc. all feature it as well. Even the standard boxing stance is just a shorter version of zenkutsu dachi, with the back leg bent. However I've noticed a universal tendency among students who are in this posture to turn their front foot out just before taking a full step. The students are, in effect, converting their zenkutsu dachi into an "open zenkutsu dachi" (or in Chinese, moving from "gong bu" to "bai bu"). This is understandable; the turning of the front foot opens up the hips and allows freer forward passage of your body. However it is also undeniably "telegraphic". Unless you're doing a drop step (and putting pressure on your opponent), this extra "turn" takes time and tells your opponent what you're about to do. Accordingly, I'm not surprised to see people turning their front foot out in basic stepping. I have embedded below a few examples of this tendency. I raise them not to denigrate the practitioners, but to illustrate that this is common. Even though I've been working on it for years, I always have to be on my guard not to "slip" in this respect. It is a never-ending battle of control over the body, which is why everyone needs to "go back to basics" occasionally to ensure that the appropriate standards are maintained. Turning the front foot when stepping forward: the most common error I have encountered in 30 years of training. We all do it to some extent! Not only is such extraneous movement and telegraphing an issue with forward stepping, but it is even more of an issue with stepping backwards. In that case, students will commonly raise their back heel before stepping back with their front foot. I'm not sure why this happens but it is, again, universal. Take a look at the video below in which the practitioner (very handily!) demonstrates both forms of telegraphing (ie. both forward stepping and back). As before, I don't wish to be seen to be denigrating his performance; the level of control required not to move the front or back foot (as the case requires) is very high and, depending on the day, you might well catch me doing the exact same thing! The issue is not whether we do it or not - but rather whether we are aware of what we're doing, if so, whether we are doing it for a specific reason and, if not, whether we are doing anything about it. Practising basic stepping for year after year without correcting one's bad (extraneous and telegraphing) form is, in my view, wasted effort. Even worse, it inculcates bad habits. If you've spent decades practising basics with an unconscious out turn of the foot on your forward step, or a heel raise on your backward step, then you can be pretty sure that it will take you decades to learn to control that movement! Another (handy) example of telegraphing in both forward and backward stepping. Below I've embedded some class footage of my own students stepping in class. Nearest the camera is Jeff who has been with us since 1987. He joined in an era where we spent a lot of time "walking up and down the floor". I'm sure you'll agree that there is practically no telegraphing at all in his movement. Some natural stepping practice performed in one of my classes. I'm proud to note the relative lack of extraneous movement and telegraphing - at least on this occasion! One of the final points I will make about natural stepping and its role in developing economical, efficient movement is the need to eliminate any "rise and fall". I've done the whole "sine wave" thing to death, so I'll just recap briefly that in the melee range you don't have the luxury of extraneous movement - and this includes rising and falling. The shortest distance between two points is a straight line, and accordingly that is what you should be aiming for when closing the gap or evading. "But," I hear you say, "isn't the sine wave necessarily part of natural stepping?" Indeed, in previous articles I have maintained that the sine wave pattern does become evident over multiple natural steps. Yes, natural stepping (eg. when you walk down to the shops) does have a "rise and fall". 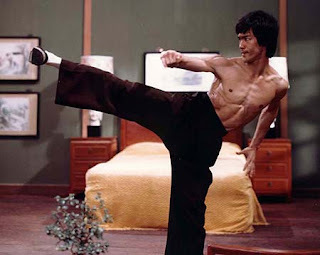 But we traditional martial artists don't use natural stepping in combat. 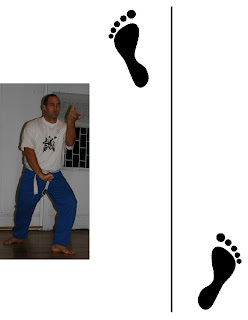 We use lunges and related footwork (yori and suri ashi). Accordingly when we practice natural stepping we only do so to amplify, and add load to, the kinds of steps we're actually going to do. In other words, we aren't practising natural stepping to improve our natural stepping - but to improve our other (more abbreviated) stepping (eg. when we lunge or do a suri ashi, etc.). Since we will be moving 3-4 feet at best in a furious melee exchange, probably by initiating movement with a front foot step (ie. a lunge) the whole business of "sine wave" is irrelevant. In fact, it is imperative that we eliminate any unnecessary "bobbing" movement as much as possible in our melee range approaches and retreats. If we need them for a particular reason5 we can always insert them as required. But we must have the necessary control to be able to move as economically and efficiently as possible. Papering over one's inability to move with such efficiency by inserting dogmatic "bobbing" does not alter this one iota. Consider the video below and you'll see the sort of control I'm talking about. If you can stay level like this during as step, then you can also choose to bob up or down whenever you choose.5 In my experience, it doesn't go the other way. An example of excellent height control in natural stepping. There are many other specific comments I could make about natural stepping using basic stances. 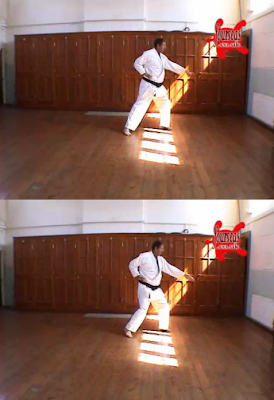 For example, I could observe that it teaches you to protect your groin by using crescent stepping. But in the end, these are all related to my original point: natural stepping in class makes for a bigger, more complete movement, which in turn permits better analysis and correction. Even though I've been training for 31+ years now, I still take the time to practise such stepping myself. Moreover, I've learned not to ignore my students' need for such practice. 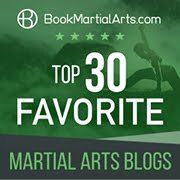 We should never lose sight of the fact that many martial arts training methods are not "fighting tactics" but are drills; drills for inculcating fundamental principles and conditioning the body. Sometimes these can look very formal or non-martial (for example, the uninitiated might wonder what skipping with a rope has to do with boxing). But this misses the point. Not everything we do in martial arts class will look like fighting. Stepping in basic stances is one such thing. And today it remains as relevant to developing traditional martial skill as it ever was. An instructor gives some advice that I routinely give in relation to basic stepping. Note the age and experience of the student - we're never too old or senior to stop focusing on basics! Some very good stepping - take a close look at their feet during movement and note the almost complete lack of telegraphing. Note also the way they maintain a level height. 1. I describe what I mean by "natural stepping" in this article. Clearly, stepping in any formal stance is going to have some element of "artificiality" to it. All I mean by "natural stepping" is that the back foot initiates the movement, then passes the front foot, and so on. "What struck me most about the taiji practice was the speed at which it was being performed - or I should say the lack of speed. In some cases movements were being executed so slowly that I wondered if the practitioners were frozen, often mid-step." In fact, the leader of this particular group seemed to defy gravity, by hovering with her front foot off the ground and her weight half-way towards it. On closer inspection I realized she was, in fact, in constant motion - just at an excruciatingly slow speed. The level of control she had on her core and other supporting muscles was astounding. This sort of ability to "freeze" transitional points is clearly the exception rather than the rule. 3. There is nothing wrong with training every kind of step - even lunges and half steps. In fact, this should be done regularly in any traditional dojo/guan/kwoon/dojang etc. For example, occasionally I focus on the simple lunge (oi ashi) with a jab, followed by a retraction (hiki ashi) with a deflection. 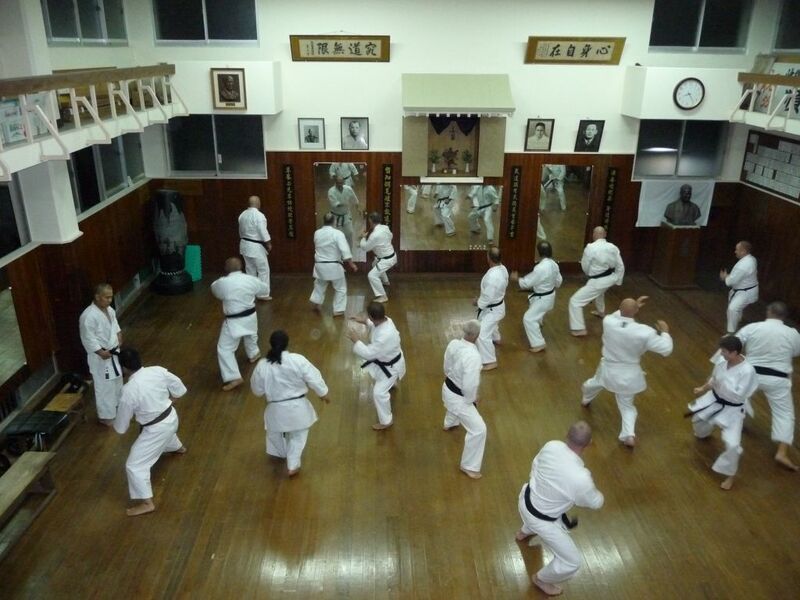 Commonly I will have the students move from cat stance (neko ashi dachi) to forward stance (zenkutsu dachi) but other stances can can also be used. 4. For subtle skill involving a very high level of body control, note Adam Hsu's movement below. As a colleague of mine on the Traditional Fighting Arts Forums noted, this sort of skill isn't something you can learn off Youtube. There's a lot more going on than is apparent to the uninitiated. 5. Of course, nothing prevents us from using particular footwork to drop or rise; we might do so for evasion, or as part of a counter attack, etc. In that case, we can use the push off from the ground or gravity (as the case requires) to assist our techniques. But this is a far, far cry from the wretched "sine wave" theory which dogmatically insists that this "gravity assist" or "push off" will somehow form part of each lunge in the melee. Most melee movements are simply too fast and too short to take advantage of either. For more on this, see my article: "Rise and fall" ≠ sine wave theory. Something I wanted to comment on was with your front stance. We actually train to move the front foot before we move from forward stance to forward stance... We do Cuong Nhu, a style that practices multiple martial arts. Beginners (that's me) do shotokan Karate first.I never really asked about why we move the front foot, I think I'll ask my instructor when I see him next about that... Thanks for the interesting article! The question is, are you deliberately turning your front foot, or doing it unconsciously? I teach beginners to turn their front foot in cat stance. But then again, this stepping isn't offensive (your weight is back) so the "telegraphing" is irrelevant in that context. In bagua there is one palm change where you turn your front foot out before moving - but the turn is accompanied by a downward parry (meaning that you are doing something else besides turning your front foot). Everything is okay in context and when it is deliberate. When it is unconscious then things are very different. 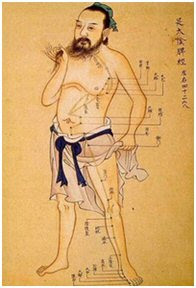 Musashi's Water book mentions that "with large or small steps, your feet must always move as in normal walking." While circumstances will dictate just how a person steps into or out of attack, working towards effective natural movement in self defense can simplify things immensely. Not that moving efficiently during natural stepping is easy, as your article clearly illustrates. Kudos Dan! It's a good thing Shinkendo combined the foot movements and drills from kenjutsu into aikibujutsu. "Whenever I have attempted to shortcut my students' development I've in effect short-changed them. Whatever skill I have now is not a function of what I am doing now; it is a function of all that went before." Wonderfully said! I am in total agreement. I too began my martial arts training moving up and down the line. And I did that well. Or at least performing as I was expected to do. Even then I saw it as only part of my training, and I depended on other bits of training as much to help me deal with dynamic movement. When I went to the States however, one of the first most profound lessons occurred when I was fighting a person who'd later become one of my teachers. I was facing off with him and was thinking in my mind how such a huge and fat person would never be able to move fast enough. And so I'll give him a break. As soon as I twitched ... he had a fist about one inch in front of my nose. Literally I could not understand how he moved so damn fast. I had to take my training out of the dojo and spend time trying to analyse how he moved so quickly using only the basics - stuff I was 'supposed' to be doing, yet apparently I was doing it all wrong. The further study I did eventually awakened my mind to problems with line drills, analogies, and assumptions that beginners face in their training all the time. Once I figured that out, my movement has become much more efficient, and as you say, the stances are moments of stability - I can't remember the exact phrasing you use, but it's true. 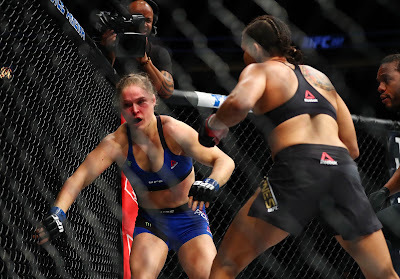 One of my instructors would call them kodak moments ... and was deriding them for making bad martial artists. That same instructor was also big on a book on 'kinematics and dynamics of karate' a work talking about the compression and expansion of inner and outer muscles of the leg whilst moving from stance to stance. That has been my focus recently - the stances are only there as a framework to understand how to apply the compression and expansion of the inner and outer thigh muscles to get from place to place or to generate power. Wow. 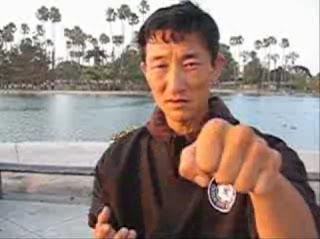 That video of Adam Hsu made me realise just how little I know, how poorly I use my body to achieve its aims in combat. My gross exterior (omote) might appear to have reasonably good technique, but the subtleties, the hidden, internal aspects of techniques (ura) are largely wasted. I wonder if I'll ever achieve that level of self-mastery. I do have a question for you though! It's difficult to express through text, but when stepping back in zenkutsu dachi, when should the back foot (which becomes the front foot) straighten to face straight ahead? And does the pivot happen on the heel or the ball of the foot? Basically you should have your weight on the balls of your feet. As your back foot draws level to your front and your knees have come together in the crescent step) your back foot will pivot slightly to face forwards (the pivot starts as you near the mid-line). After your foot passes to step forwards, what was your front foot becomes your back. It pivots out a bit more as you finish your step, again on the ball of the foot. This helps push your body forwards and add some momentum to the last section the step. Why pivot on the ball of the foot? At the mid point, you don't want your supporting foot pivoting on the heel as you would be on a highly unstable platform. You need mobility and you need stability. 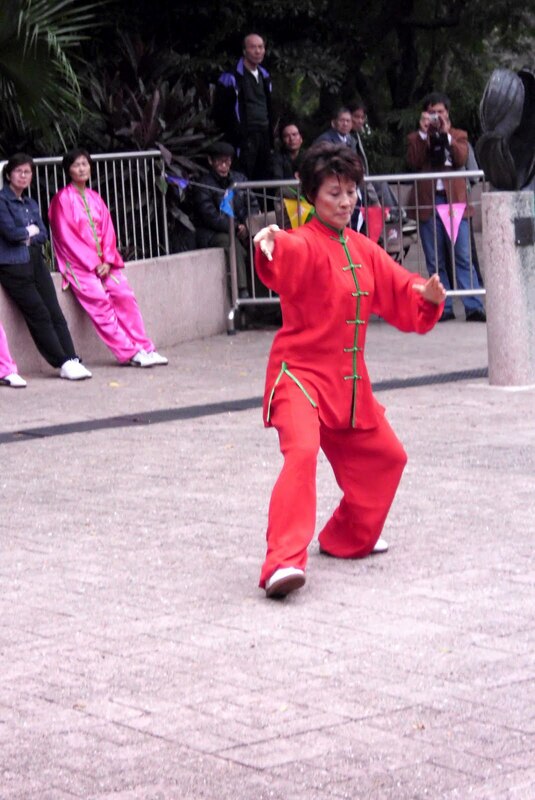 If you were to simply pivot out (bai bu) before you stepped, that would be different (you would pivot on the heel). But that generally telegraphs, as I've discussed. We do it in bagua etc., but this is usually accompanied by some sort of defensive action (eg. a deflection) or with a drop step, meaning you're doing something else at that time, not just pivoting the front foot on its own. In terms of why you continue to pivot your foot on the ball of the foot at the end of the movement, you would have started on the ball of the foot. Moreover at the finish your tendency will, if anything, be to lift the heel. This should tell you where your weight will probably be placed naturally.